The empirical evidence collected by Consultative Group to Assist the Poor (CGAP) shows that financial inclusion is positively correlated with growth and employment. The evidence shows that individuals that participate in the financial system, are better able to invest in themselves, manage risks due to reliable access to capital. Access to capital empowers societies, especially women and other minorities and has positive effects on consumption and employment status. Greater access to financial services for both individuals and firms can also help reduce income inequality and accelerate economic growth. Global and national policy makers are making financial inclusion a key development priority as evidenced by efforts like Universal Financial Access by 2020 (UFA 2020), ID2020 and World Bank Group’s Identification for Development Initiative (ID4D) or India’s initiative to ensure access to financial services in an affordable manner, called Jan-Dhan Yojana. In recent years more than 50 countries have set formal targets and ambitious goals for financial inclusion (1). Households that do not have an account at an insured institution, meaning that no one in the household had a checking or savings account. Households that had a checking or savings account and used one of the following products or services from an alternative financial services (AFS) provider in the past 12 months: money orders, check cashing, international remittances, payday loans, refund anticipation loans, rent-to-own services, pawn shop loans, or auto title loans. In the US market alone, as of 2015, approximately 9.0 million U.S. households, made up of 15.6 million adults and 7.6 million children, were unbanked and approximately 24.5 million U.S. households, composed of 51.1 million adults and 16.3 million children, were underbanked. The unbanked and underbanked households present an opportunity for banks to expand access to and utilization of their products and services. The Global Financial Inclusion (Global Findex) database, launched by the World Bank in 2011, provides comparable indicators showing how people around the world save, borrow, make payments, and manage risk. 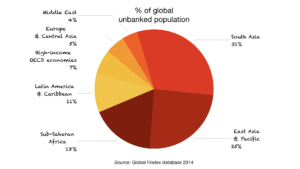 In this database, an account ownership metric is used to measure the number of people globally, who would be categorized as “unbanked” and “underbanked” as defined above. 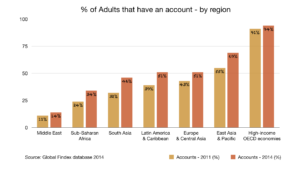 As of the 2014 survey, the number of adults without an account—the unbanked—fell from 2.5 billion to 2 billion. The largest opportunities still rest in developing areas, such as the Middle East and sub-Saharan Africa where 86% and 66% of adults, respectively, do not have traditional bank accounts. In terms of absolute population, 55% of the global un(der)banked — 1.1 billion individuals — reside in Asia-Pacific countries, primarily China, India and Indonesia. Based on an analysis of the barriers to account ownership, globally, the most common reason is the lack of enough money to use an account, followed by a limited need for an account and the existence of a family member who already has an account. Affordability combined with extensive documentation requirements also serve as barriers to financial inclusion. Fixed transaction costs and annual fees combined with limited credit and risk metrics, tend to make transactions unaffordable for large parts of the population in developing economies. Similarly, documentation requirements may especially affect people living in rural areas who are less likely to have formal proof of domicile or wage slips. Governments, policy makers, financial services and fintech companies can help improve financial inclusion in their respective countries and markets by focusing on financial education, improving affordability of their offerings and embracing technology to provide ubiquitous reach or access to financial services. Governments and policy makers, can help provide a regulatory framework that is conducive to expanding account ownership—through such actions as licensing bank agents, introducing tiered documentation requirements, requiring banks to offer basic or low-fee accounts, and allowing the evolution of new technologies such as mobile money. Such initiatives can both help lower the cost of financial services and help reduce the distance to financial institutions by making it cost-effective for them to locate outlets in more remote areas. Financial inclusion can be also expanded among the un(der)banked by moving welfare and other cash payments to bank accounts. While this approach has the benefit of improving the efficiency and speed of payments, thereby lowering distribution costs, its biggest benefit will be the elimination or minimization of financial intermediaries that engage in predatory practices that jeopardize the security of these welfare/cash payments. This shift to digital payments can provide a formal entry into the financial system, which can lead to significant benefits to the newly banked individuals. Sub-Saharan African countries are unique in the world in their significant use of stand-alone mobile money accounts. Mobile money services like M-PESA in Kenya, MTN Mobile Money in Ghana, have enabled the underserved to access financial services. Establishing trust in stand-alone mobile money accounts is critical. The ease of mobile payments can be used to build an initial level of trust, which in turn can create entry points for ancillary savings products, credit access, insurance, and other services. Among the un(der)banked, peer recommendations are a significant factor. Prospective service providers can leverage these peer recommendation networks via trusted brand partnerships, community outreach programs, and distribution through consumer-favored methods in order to establish trust and expand their brands. Beyond money services, opportunities exist in communal lending, insurance, and savings. Financial services and fintech companies, need to develop solutions that take into account the primary barriers to financial inclusion, such as, limited cash flow, limited trust in financial service providers, and need to adapt to changing consumer behavior, before further engaging these consumers. In developing countries, many consumers borrow money from friends and family or other sources of short-term credit outside the traditional financing world. Aspects of this “communal lending” are the exact characteristics that underlie the burgeoning peer-to-peer (P2P) insurance model and could serve as a strategy for lending in un(der)banked populations. Many P2P insurance models rely on the formation of groups that share common attributes — this is a proxy for social responsibility in the model. As development occurs, the necessity of insurance rises much faster than the underlying GDP of the market. The un(der)served likely do not see the benefit of the insurance. Local regulatory regimes play a huge role in the penetration of insurance services in developing countries. Many emerging and frontier markets still have restrictions on foreign entrants through requirements on maximum foreign shareholdings or joint venture requirements. Initiative to educate consumers on the value and benefits of insurance, simple product design, affordable insurance solutions combined with the perceived ease of transaction should lead to increased penetration of the un(der)insured. Distributed ledger technologies (DLT) and Smart contracts, which aim to simplify and automate the setup and execution of policies, can be used to facilitate claims payments, reducing the time and transaction fees of traditional channels. Identities maintained by distributed ledgers would create immutable records. Smart contracts can address excessive cost burden without significant risk or business model change, potentially enabling nearer-term adoption. Smart contracts could also then be used to retrieve additional personal information and send aid in the form of vouchers for goods and cash. This blog post outlines a topology to understand the rapidly growing fintech industry and institutions operating in the space. Online marketplace lending refers to the segment of the financial services industry that uses investment capital and data-driven online platforms to lend either directly or indirectly to consumers and small businesses. Mobile payments allow consumers to use their smartphones or other mobile devices to make purchases and transfer money. Consumers and businesses use these devices to make and receive payments instead of relying on the physical use of cash, checks, or credit and debit cards. Digital wealth management platforms, including robo-advisors, use algorithms based on consumers’ data and risk preferences to provide digital services, including investment and financial advice, directly to consumers. Digital wealth management platforms provide services including portfolio selection, asset allocation, banking and account aggregation, and online risk assessments. Distributed ledger technology involves a distributed database maintained over a network of computers connected on a peer-to-peer basis, such that network participants can share and retain identical, cryptographically secured records in a decentralized manner. The FinTech Industry is not a new industry, and its opportunities, risks and legal implications are not novel. The current concerns of policy-makers and industry arise not from the technology itself but from who is applying the technology to finance. 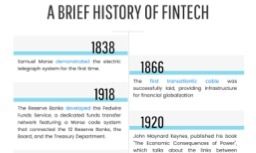 FINTECH: WHERE DID IT START? “Financial Technology” of “FinTech” simply refers to the application of technology to create new and improved financial services for consumers and businesses. Most consumers experience FinTech through activities like checking their bank balances online, executing trades through their online brokers or tapping their smartphone against a pay terminal by using services like Apple Pay, Android Pay, etc. FinTech was the original name of the Financial Services Technology Consortium, a project initiated by Citicorp, a predecessor to today’s Citigroup. This term now represents a hyper growth industry in which global investments (VC and M&A investments) have increased from US $4 billion in 2012 to a staggering US $47 billion in 2015. The introduction of telegraph in 1838 and laying of the first transatlantic cable in 1866 provided the fundamental infrastructure necessary for the digital age of financial services. This time period culminated with the introduction of credit cards in 1950, the first handheld financial calculator, and the deployment of the first ATM in 1967. This time period saw the establishment of automated clearing houses in United States and United Kingdom between 1968-1970. NASDAQ, established in 1971, ushered in electronic securities trading platforms. In 1982, a company named TradePlus kick-started the online brokerage investment revolution and quickly started driving down the cost of online trading. The mainstream emergence of the internet greatly affected financial services. Wells Fargo became the first bank to offer an online checking account in 1995. By the end of this time period, a majority of banks’ internal processes, interactions with outsiders and an ever increasing number of their interactions with retail customers had become fully digitized. In fact, the Financial Services industry spent close to US$560 billion worldwide on IT in 2008. The financial crisis of 2008 can be viewed as the turning point for FinTech. Three factors, distrust of banks in the minds of the general public, large pools of highly qualified financial professionals out of jobs and regulatory factors, resulted in the creation of the perfect incubator to allow the FinTech industry to bloom into a hyper-growth market.